The sheer variety in any given issue of 2000AD is both its greatest strength and weakness. It’s a strength because no other comic I’ve ever encountered has the same willingness to experiment and shift tone, strip by strip. It’s a weakness because, inevitably, strips tend to start together which means it can be difficult for new readers to jump aboard. I reviewed a prog a little while back, specifically the one featuring The Closet, arguably one of the best Judge Dredd one-shot stories in years. The response was pretty positive, several people suggested I make it a regular fixture and with Prog 1824 being an all new line up, this is the perfect time to do it. Cypher, the Judge Dredd story kicking off here looks set to be another mythos-heavy one, but Dredd is configured in such a way that that isn’t a problem. The epic Day of Chaos storyline, being collected at the moment, essentially hammered Mega-City 1 all but flat, decimating the Judges, unleashing a virus inside the city walls and wiping out a sizable portion of the population as long-term retaliation for the destruction of East-Meg 1 in the Apocalypse War several years previously. Now, for complete newcomers to the title that probably looks a little like a sentence in Esperanto but what it boils down to is this: Some years ago, in continuity, the largest Russian City left standing started World War IV and lost when Dredd spearheaded a massive retaliatory strike against them. Years later, they struck back and the Justice Department is still picking up the pieces. Alec Worley’s return to newly corporeal, and so very happy about that, Dandridge initially seems to be the sort of pseudo-70s retro nostalgia that 2000AD seemed to produce for almost five straight years in the late ‘80s/early ‘90s. Thankfully there’s a lot more going on here than there first seems to be and Worley has a very keen eye for detail. Dandridge’s bizarre rock and roll exploits are fun, but it’s the little details that stay with you; the idea of an angelic tailor, the fact that Dandridge has a skill called ‘Savoir fu’ and so on. This is a pun-heavy riff on Jason King, Department S and the like but is has it’s own voice and I’m looking forward to seeing where Worley goes with it. If it involves the phrase ‘Ding DONG!’ I for one won’t be disappointed. The story’s helped immensely by the fact Warren Pleece, who’s rounded, slightly burly style has been a favourite of mine for years, is on art duties. It complements the knowing tone of Worley’s script to create a story which has just as much of a sparkle in its toothy, slightly gin-soaked grin as its hero. Survival Geeks wrong-footed me completely on first read through. 2000AD has a long tradition of various one shot, twist ending stories, usually called ‘Future Shocks’ which were, and still are, a proving ground for the best comic writers the UK produces. I’m so used to seeing these that reading this story initially felt like a slightly flat Future Shock, with some fun characters and a slightly botched ending. I was a little disappointed. Then, I went back and read the description for the story on the contents page. It’s the first in a series called ‘Tharg’s 3rillers’, a new project where stories like this will be spread across three parts and reading it back as the first act of a three-parter it’s far more fun. Sam picks up Simon at a bar, they spend the night together and then she wakes up and sees his bedroom, whiich looks a little bit like someone blew a comic shop up like a balloon until it exploded and scattered memorabilia everywhere. Creeping downstairs she finds out three things in short order; she probably needs to find a new type, Simon has two housemates including a genius called Clive and the house might not be…quite where it was before. The good news is Clive’s perfected inter-dimensional travel. The bad news is he’s decided to use the house as a test vehicle. The worst news is they’re a bit lost. As an individual chapter (Remember kids, always read the contents page!) it’s fun but flawed. As a short run story it has tons of potential that I’m really looking forward to seeing play out. Gordon Rennie and Emma Beeby are on top form with the script and Neil Googe’s art is typically gorgeous. Googe specializes in two things; normal looking people and the utterly fantastic. He gets to do both here and is aided hugely by Gary Caldwell’s colours, combining suburban normality with just a flash of the alien. Think Spaced with actual science fiction content and you’re most of the way there. Finally, Ian Edginton’s Stickleback makes a welcome return. Edginton is an incredibly prolific author, especially for 2000AD and all his work for the title ties in and echoes everything else in unique and very clever ways. 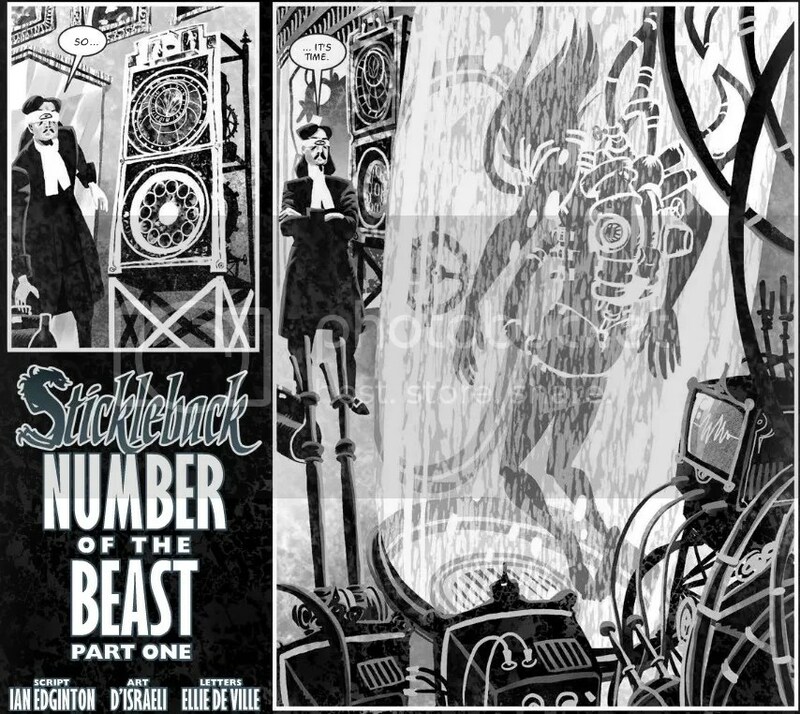 Stickleback is his take on Moriarty, London’s self-styled ‘Pope of Crime’. However, this is a definitively steampunk London, and an unusually grotesque one at that. Stickleback’s gang are all physically unusual in some way, including Stickleback himself, who has an exposed spine. Of course it might not be real but appearances are everything in the London underworld. This story, The Number of the Beast, opens with what seems to be a botched mass murder and robbery that leaves one criminal consumed by an explosion and revealed to be a huge reptile. Clearly something needs to be done and so the mysterious Doctor Orlando Doyle awakens Stickleback from the regenerative tank he’s spent five years in. But Stickleback isn’t the man he used to be and London is very, very different. This is just beautiful. There’s no other word to describe D’israeli’s black and white art, filled with character and motion and maniacal industrial invention. The art and scripting across the entire prog is massively impressive but this story is the easy standout. You get a real sense of the massive structure Stickleback is kept in, the squalor and clamour of London and the Steampunk changes in the city, shot through it like gleaming metal in old stone. 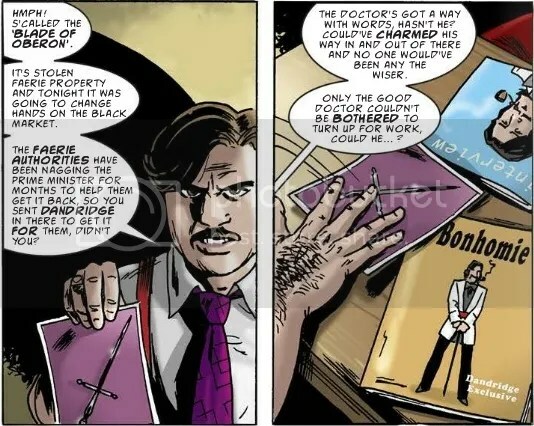 This is as close to perfect as you’re likely to get with comics, Edgington’s seething, flamboyant criminal wrapped in the trappings of the brave new industrial age and rendered by the perfect artist for the job. 2000AD is on an absolute roll at the moment and this issue shows why. It’s not just a perfect jumping on point for new readers, it’s a perfect showcase of the invention, intelligence and artistry that the title, at its best, epitomises. Entire generations of British comic writers and artists have cut their teeth here, as have entire generations of fans. Join them, there’s never been a better time.